Kepler-88 (also known as KOI-142) is a sun-like star about 1200 light years away. It is one of the stars monitored by the Kepler satellite, which looks for minor fluctuations in a star’s brightness. When a star’s planet passes between us and the star, some of the starlight is blocked by the planet, making it slightly dimmer. The change isn’t much, only a small fraction of a percent, but it is enough to measure. So by observing the brightness of a star over time, you can discover planets around that star. This method is known as the transit method. It turns out that this method detected a planet around the star, known as Kepler-88b. This planet has an estimated mass of about 8 Jupiters, and orbits the star once every 11 days. Unusual aspect of this particular planet is that its orbital period fluctuates slightly. We can determine its period by measuring the time between each transit, and this was found to fluctuate by half a day. Normally the period of a planet should be fairly regular. The only way for a planet’s orbit to fluctuate by such a large amount is for another planet to be gravitationally pulling on it. If this second planet is a bit ahead of 88b, then it would cause it to speed up a bit. If it is a bit behind 88b, it would cause it to slow down slightly. Earlier this year a paper published in the Astrophysical Journal analyzed these variations in transit, and calculated that they could be explained by another planet, Kepler-88c. This planet was estimated to have a mass 60% that of Jupiter, and orbiting the planet once every 22 days. This was the first exoplanet to be discovered by its gravitational interaction with another planet. Now a new paper in Astronomy and Astrophysics has measured the radial velocity of Kepler-88 to confirm the existence of 88c. You can see the result in the figure below. Here, observations of the star’s radial velocity are seen in red, while the black line represents a fit to that data. The orbit is a good match to the one predicted earlier. In 1846 the planet Neptune was discovered after being predicted by its gravitational effects on Uranus. Now 167 years later we’ve done the same for a planet orbiting a star 1200 light years away. We’ve made a great deal of progress in planetary astronomy. Paper: David Nesvorný et al. 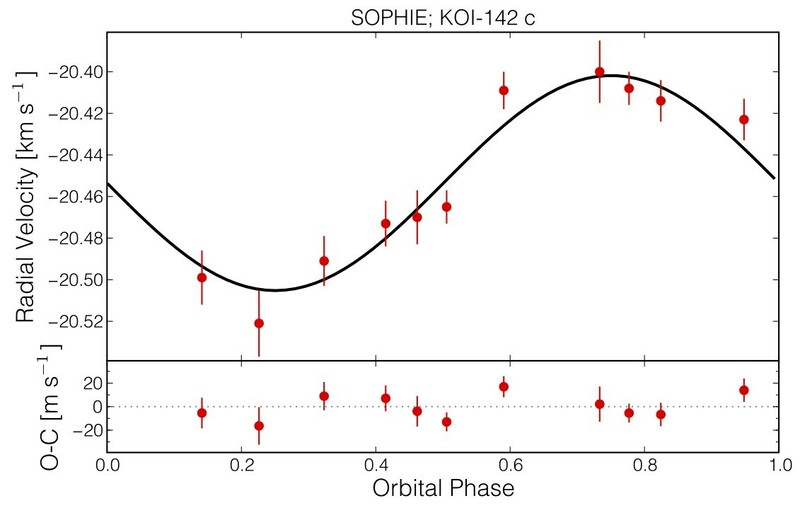 KOI-142, the King of Transit Variations, is a Pair of Planets near the 2: 1 Resonance. 2013 ApJ 777 3 (2013).